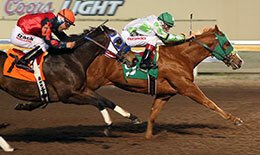 AQHA Racing Champion Kiss My Hocks sired two winners and two stakes finalist on Remington Park's Friday card. ELGIN, TX—APRIL 5, 2019—Barely a month into the 2-year-old racing season AQHA Racing Champion Kiss My Hocks sired his first and second winners and first and second stakes finalists on Friday at Remington Park. Liarliar Hocksonfire, a $32,000 Heritage Place Yearling Sale graduate, broke his maiden in his first career start while posting a :16.915 clocking for 330 yards to set the second fastest qualifying time to the $895,210 Remington Park Oklahoma-bred Futurity. The race final will be contested on Saturday, April 20. Trainer R.L. "Rick" Robinson conditions the son of Kiss My Hocks for owners Jose Guzman and Rito Sosa. The sorrel gelding, out of AQHA Racing champion mare Blazin Fire by This Snow Is Royal, clocked a :16.915 time into a 6 mph headwind for the 330 yards. He is a half-brother to five black type runners including Grade 2 winner Fire Burning. Blazin Farms LLC and Conda Maze is the breeder. Kiss My Hocks second winner came in the 11th race when Mr Perry Hock, a $70,000 Heritage Place Yearling Sale graduate, stopped the timer in :17.088 seconds to get the 6th fastest time and the top qualifying time for the $100,0000 Remington Park Oklahoma-Bred Juvenile. S. Trey Wood saddled the Kiss My Hocks gelding from the Mr Jess Perry mare Mr Perrys Wine, for owner La Feliz Montana Ranch LLC. Champion jockey Ricky Ramirez had the riding call. 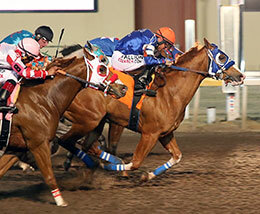 Mr Perry Hock, under jockey Ricky Ramirez, winning the 10th trial on Friday at Remington Park. Through today (Friday) Kiss My Hocks was the #5 leading first-crop sire of money earners in the US. Wins by Liarliar Hocksonfire and Mr Perry Hock in the $15,000 Remington Park Oklahoma-Bred Futurity trials tonight should propel the young stallion up the list next week. Kiss My Hocks, owned by Tyler Graham, Conda Maze and Stan Sigman, won nine of 12 career starts and earned $1,199,385. His wins include the Ruidoso Futurity(G1), Rainbow derby(G1), Sam Houston Futurity(G1). 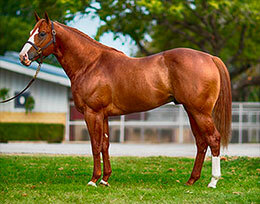 The son of champion Tempting Dash was second in the Rainbow Futurity(G1) and a finalist in the All American Derby. Kiss My Hocks stands for a 2019 fee of $5,000 at Southwest Stallion Station in Elgin, Texas. For breeding contracts or additional information contact Farm Manager Tyler Graham at 512-285-4833.